The Role of the Environment in The Baltic Crusades: A Pedagogical Exercise on the Human/Environment interaction model. ,This is a pedagogical exercise intended for sophomore or junior level undergraduates, or advanced high school students. It introduces core concepts of environmental history and applies them to the study of the Baltic crusade. It would be applicable to courses in medieval history, environmental history, and crusading. You may want to adjust the readings, or provide summaries for some of the readings depending on the focus of your class. If the class is focused on the crusades you may want to provide more context for environmental history, and vice versa for environmental history classes. For high schools students it may be necessary to summarize the readings in a power point or outline to smooth understanding of some of the more difficult concepts. To engage students in critical thinking about the interaction between cultural products and human societies' relationship with the physical environment. To promote an understanding of core concepts in environmental history. To encourage students to think about the multiple motivations for crusading. To provide background to the Baltic crusade have students read Eric Christiansen The Northern Crusades pages 93-122 and pages 192, 202-211 in "The Ecology of Crusading" by Aleksander Pluskowski, Adrian J. Boas and Christopher Gerrard, which can be found below. to gain the requisite knowledge of both the basic concepts of environmental history, and more specifically how the interaction model operates. Below is an image of Hoffman's model. "other men of the bishop who followed the fugitives and found a great many of them, namely Letts and Selones, in the forests and swamps. "(XII: 2, pg. 79). In addition to these quotations the students should read the following article which places Henry of Livonia in a wider context of European writing on wilderness and its ideological connotations. antiquity.ac.uk/projgall/pluskowski328/ and the following pdf. These will help students understand the kinds of changes that take place in the environment following the conquest of the Baltic, and how archaeologists are recreating those changes. Once the students have completed the reading they will relate the information on Henry of Livonia and the Archaeology of the Baltic Crusade to the human interaction model by placing the correct information in its respective position within a print out of the model that you provide them (attached below). 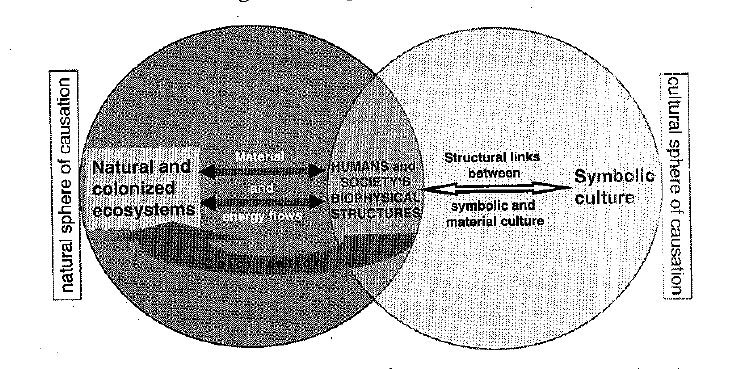 The students must also provide brief, three to five sentence analyses, relating symbolic culture to human structures and these structures to the environment, in the space provided on the handout. Encourage the students to consider all of their readings, including the introductory secondary material, in their analysis, and remind them that there are multiple options for each section of the model. ​ Once the students have completed their models, the exercise may end with an open discussion about each students' choices regarding their models, and how they envision the different aspects of the crusade they have been reading about, relate to the environment. Students should also be reminded, per Hoffman, that the model works both ways, and a discussion about environmental factors that affect the crusade can also be held on completion of the activity. 1. How do you think Henry of Livonia's portrayal of rebellious Letts escaping to the forest might affect crusader's attitudes to the forests that surrounded their settlements? 2. If we reverse the interaction model, how do you imagine the environment might have impacted crusading activity?Where might you look for evidence of the impact of the environment on the crusaders? 3. If you were going to conduct your own archaeological dig in the Baltic what features might you look for in assessing a site for investigation? 4. Crusading was only one aspect of human activity in the Baltic, what impact might the writings of chroniclers like Henry of Livonia have had on traders and settlers to the Baltic regions?